We're past mid November so it is safe to talk about Christmas now. Festive traditions, we all have them and one of those Christmas traditions that we've adopted from America is Elf on the Shelf, it seems to be becoming more and more popular each year but is it another one of those things that we spend too much money on? 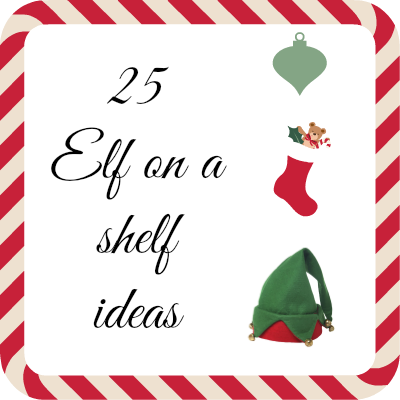 I done it for the first time last year and I had so much fun coming up with ideas for where our elf could be found each day and just what antics he'd be getting up to. This year I've joined a couple of boards on facebook and honestly I'm shocked at how much money everyone seems to be spending and I think this may start to put others off doing it. You don't have to spend £30+ on getting the "correct" elf, I got mine for around £5 in ikea last year but it can be even cheaper than that if you know someone that is handy with a needle/hook and a ball of yarn. Your elf doesn't have to be bring lots of gifts, infact he isn't expected to bring any. When you watch the Elf on the Shelf DVD you remember that the actual purpose of this activity is to keep your children believing in Santa Claus. If you want to add presents into the mix look to pound shops and charity shops for inspiration. As for the elves mischievous antics, here are 25 simple ideas that won't cost you an arm and a leg. 1. Tee pee the Christmas tree. 2. Wrap up one of the doors inside the house. 3. Have your elf watching a film. 4. Toothpaste message on the bathroom mirror, perhaps a countdown to Christmas. 5. Elf got a bit peckish and is tucking into the Christmas chocolates. 6. Poorly elf sitting in the tissue box surrounded by scrunched up tissues. 7. Someone found themselves desperate for a wee so made their way to the toilet. 8. Raiding the toy box, all toys all over the floor. 9. Reading a story to the cuddly toys. 10. Drawing over pictures hung round the house. 11. Elf turns into a lush and is found with his straw in a bottle of booze. 12. Got some cotton wool balls, then elf might just want to have himself a bath in the sink. 13. Replace your stockings with underwear. 14. Cutting out paper snowflakes. 15. Make or print out report forms letting the kids know whether they are on the naughty or nice lists. 16. Find the elf tying shoe laces together. 17. Flour + elf = snow elves. 18. Have a festive message spelled out with sweeties. 19. Play hide and seek with the Christmas decorations. 20. Pop the elf into your child's bed while their sleeping and if you're feeling adventurous using a washable pen give the kids a red nose like rudolph. 21. Instead of an angel on top of the tree why not have an elf. 22. Have your elf typing a message to Santa on your computer. 23. Elf getting stuck in the fridge. 24. Making decorations with string and cheerios. 25. 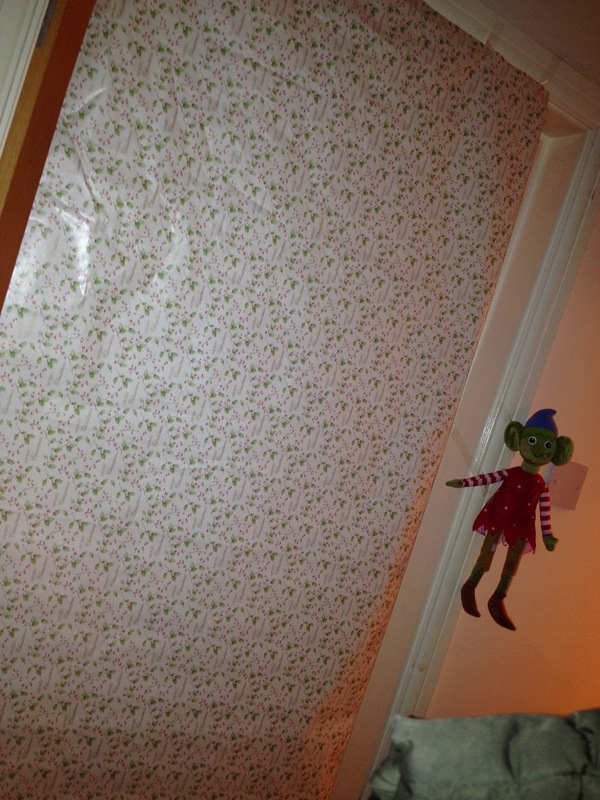 Acrobatic elf hanging/parachuting from the ceiling. Got anymore ideas? I'd love for you to share them in the comments below. Please join them up to the new linkie starting on Saturday. your are so right some ppl spend so much money and it gets lost what it is all about! I won't be joining in but i cannot wait to see all the cool and funny things your elf is gonna do on your blog/FB page! Have fun! Great post! We got our elf last year and loved it - we even took him to Tenerife for Xmas with my parents! Thanks for doing this list though as we did start to run out of ideas. We weren't very prepared last year so trying to get some ideas in advance this time! !